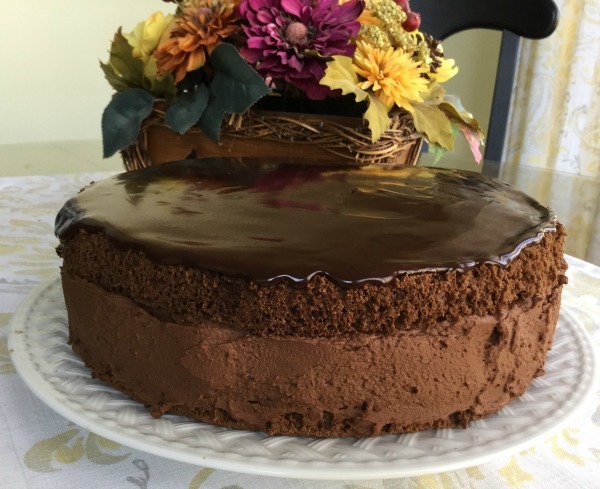 I made this dark chocolate mousse cake for Hubby's birthday last week. As my son tells it, cakes in the Just One Donna household follow a hierarchy. Hierarchy actually refers to the cake's level of complication and overall decadence. Lowest in the cake hierarchy are the boys' birthday cakes. Those cakes were usually a store-bought ice cream cake, which was always what they asked for. Next comes holiday cakes, which are usually selected from the list of family favorites. At the top of the hierarchy is Hubby's birthday cake. He has quite a sweet tooth and the cakes are usually carefully selected to surprise and delight his taste buds. 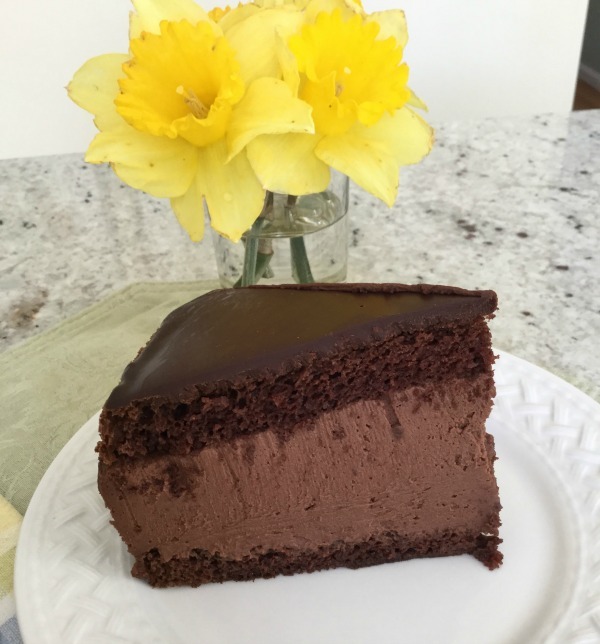 This dark chocolate mousse cake has been hanging out on my Let Me Eat Cake Pinterest Board. It is a Bon Appetit recipe from 2001 which I think qualifies it for an oldie, but goody label. Oldie, but goody, or not, this one decadent chocolate cake. It is made in multiple steps and takes a few hours, but it really isn't hard to make. The result is impressive, delicious and worth the effort. 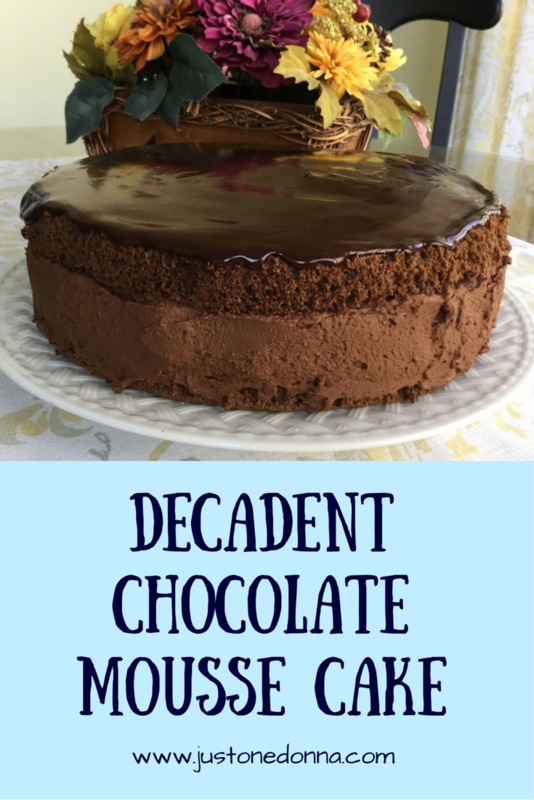 Hubby said it was better than a very similar chocolate mousse cake he had had in a fancy, high-priced restaurant. That was very nice and much appreciated praise. As is usually the case, I made a few changes to the original mocha layer cake with chocolate rum cream filling recipe. Make either recipe and you're sure to be delighted. Before making this chocolate cake I read through many of the comments in the original recipe. There were two repeated complaints about the cake. The first was that there was far too much cream filling for the cake. The second was that there was too little cake. It was suggested that two layers of cake needed to be baked instead of the one layer as per the recipe. I wasn't at all concerned if there was too much filling, but I did go ahead and make two cake layers, just in case one was not enough. In my opinion, after making this cake, both complaints are unjustified. Only one layer of cake is required and the amount of cream filling is generous, but not too much. Start at least one day in advance of serving. Make the filling first. You want the filling to cool for at least six hours. It should be very thick when you take it from the refrigerator. Use parchment paper instead of waxed paper to line your cake pan. The cake will loosen from the pan with greater ease. Only make one layer of cake as the recipe suggests. It does take only about 30 seconds to whip the filling into a mousse consistency. Don't overbeat it. Be generous with the filling. It will be an inch thick when you spread the filling over the cake. Take your time to make it flat and level. I used an offset spatula to make the edges flat. Warm your topping for about 20 seconds at 50% power in your microwave before spreading it on the cake. You want the topping to pour, but not be so thin that it will drip down the sides of the cake. You want your cake to chill in the refrigerator for at least six hours or more. This allows the layers to meld together. This is a lovely dark chocolate mousse cake for a birthday or any special occasion. It takes a little effort to make but is well worth the effort. Your family and friends will be impressed and enjoy every bite. Oh my gosh, this looks delicious! I'm going to have to try this recipe and soon! Pinned! Thanks so much for pinning. It's greatly appreciated. This cake is awesome!! It is now one of my favorites. If you love chocolate you will love it, too. Your husband should feel very special that you went to extra love to make this delicious cake for him. I am sure he shared with the rest of the family so it may come up as a future request. Hi, Katleen. Yes, I think this cake will become a family favorite. It is very delicious. Your recipe's sound delicious! Back in the 1960's my sister found the most awesome Chocolate Mousse Cake at a store in Manhattan known as Balducci's. Just a few months ago I searched on the internet without finding it. I did find some great recipes. You seem to have more of what I am looking for. I think I will try it for my birthday in September. TFS. Hi Juanita. I'm happy you found me. I really enjoy this cake and hope you will, too. I'd love to hear what you think when you make it. This is a special occasion cake, in my opinion. Your birthday will be a perfect time to try it.